Set on a scenic beach front location and designed in a relaxed contemporary style, this villa with infinity pool is conveniently located, and tastefully finished. Amenities LCD satellite TV/DVD, stereo system with iPod dock, WiFi internet, full air-con, fully-equipped kitchen, BBQ on request. 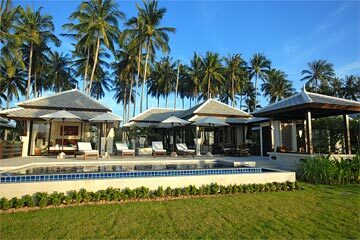 Villa Champagne is a well-appointed beachfront holiday home, blending Thai elegance with comfortable and practical contemporary beach style living. Set within a small exclusive development next to a fishing boat marina in a quiet coconut grove, Villa Champagne has direct access to the white sand beach of Plai Laem on the fashionable northeastern coast. The villa comprises 2 pavilions, separated by an entrance corridor and a wooden deck with al-fresco dining set facing the pool and sea. The first pavilion includes an open-plan living room and a double bedroom. The second pavilion has two bedrooms; a double and a twin. An expansive pool deck flanks the infinity pool, which has submerged steps, and Jacuzzi bench seating to enjoy the breathtaking sea views. The pool area has its own washroom with outdoor shower, and is furnished with cushioned sun loungers and parasols. A pool-side sala pavilion offers a shady refuge from the mid-day sun, and is ideal for enjoying cocktails while taking in the dramatic sunset, or relaxing with a Thai massage. A grass lawn separates the pool from the scenic palm-fringed white sand beach. The air-conditioned open-plan living room features vaulted ceiling with fans, and glass sliding doors on 2 sides that open onto the pool deck and balmy sea breezes. The living room includes a lounge area with a comfortable sofa set and coffee table facing the sea views, a dining table seating 6, and a fully-equipped kitchen. Multi-channel satellite plasma TV/DVD and a stereo system complete the entertainment facilities. The fully-fitted western kitchen includes an electric hob, oven, fridge/freezer, microwave, coffee maker, tea kettle, and toaster. The 3 air conditioned bedrooms are spacious, and equipped with ceiling fans, large fitted wardrobes, and dressing tables. The master bedroom has a king-size bed, en-suite bathroom with a tub and walk-in shower, and glass sliding doors that open onto the pool deck and fantastic sea views. The second bedroom has a queen-size bed glass sliding doors opening to the front with access to the wooden terrace and sea views beyond, and the third has twin beds. Both the queen and the twin bedrooms have en-suite bathrooms with walk-in showers. Villa Champagne is an ideal and affordable beachfront holiday home for friends and family, conveniently located within easy reach of the island’s main attractions. During low tide the sea may recede over 100 metres, and the shallow bay is sheltered and calm. It’s a short 5 minute drive to Choeng Mon beach, which offers good swimming conditions all year round, while Chaweng beach is 10 minutes drive away. There are numerous restaurants within a short drive, and in-villa chef service can be arranged at a nominal charge. Located on the northeastern tip of Koh Samui, approximately 10 minutes from the airport, 5 minutes from Big Buddha beach, and 10 minutes from Chaweng’s beach, restaurants, shops, and nightlife. Santiburi championship golf course is around 30 minutes away. Rates are for the entire property, sleeping up to 6 guests in 3 en-suite air-conditioned bedrooms, 2 of which are double, and 1 twin. -Minimum stay of 4 nights in low/mid season, 7 nights during high season, and 14 nights during Xmas/NY. -Check-in time is 15:00 and check-out time is 12:00, although early arrival and late departure may be requested subject to availability. Add $50 USD per night to include breakfast, with a choice of American or Asian sets. Add $150 USD per night to include breakfast, daily lunch or dinner, and 2 massages per day. 10% discount for any booking confirmed within 5 days of arrival. Cannot be used in conjunction with other promotions. Not applicable for Xmas/NY. 10% discount for booking made 60 days or more in advance. Applicable to new bookings, and cannot be used in conjunction with other promotions. Not applicable for Xmas/NY. Fresh linen and towels every 3 days, and pool towels every 2 days. No charge for infant's cot. Thai cook service, at a charge of 2000 THB per meal, exclusive of provisions. Thai massage, 500 THB per hour. Oil massage, 600 THB per hour. Babysitting, 150-250 THB per hour. Outsourced laundry service, 100 THB per kilo.